In a country still invested in reckoning the extent of its dark inheritance, Brett Murray’s art plays a provocative and dangerous game: it stirs laughter. Commenting on the satirical drift of his work, critic Hazel Friedman once remarked: “The raw power of Murray’s work lies in its ability to strike the viewer in that place where a laugh and a gasp are indistinguishable.” That breathless gasp she speaks of is important here. Widely regarded as one of South Africa’s foremost sculptors, Murray’s output is characterised by its bold pop language and uncompromising directness. The affront offered by his body of work, which includes painting and photographic installation, spans nearly the entirety of his artistic career. An early highlight dates back to 1989, the time of his first solo show, held at Johannesburg’s Market Gallery. Comprising a selection of plump, painted fibreglass and resin sculptures, the show daringly announced Murray’s engaged, agitprop style, this during an extended state of emergency, apartheid’s demise imminent but, then, still unthinkable. His mordant wit, encapsulated in sculptural works showing, for example, a butcher, his legs neatly hacked off, and a policeman, quite literally too big for his boots, struck a chord. Notably, a group of white, right wing extremists were incensed by his mocking gestures. More recently, his acclaimed public sculpture, simply titled Africa (2000), and installed in Cape Town’s St George’s Mall, caused upset for its rendering of African sculptural forms as commodified, high kitsch. Dutifully, important people were offended. The key point in all of this is to recognise that Murray’s work straddles an equally momentous and awkward period in South African history. As such, it is important to appreciate that Murray’s biting satire is modulated by his “sustained interrogation of identity”, as critic Ivor Powell has characterised it. Sometimes this interrogation is generic and sweeping, as a satirist must be to achieve affect. Good examples of works produced in this mode include, his steel cut-out cartoons, such as Zulu Heaven (2002), and his Bubble Head (2002) series of painted bronze sculptures, which humorously comment on whiteness, a prickly subject in contemporary South Africa. Set against these broad enquiries into identity in a postcolonial context, Murray has also produced works with a more self-reflexive pitch. In his photographic installation, Guilt and Innocence: 1961-1989 (1997), he exhibited an archive of personal family photographs that poignantly demonstrated his own involvement in the subject of his art. 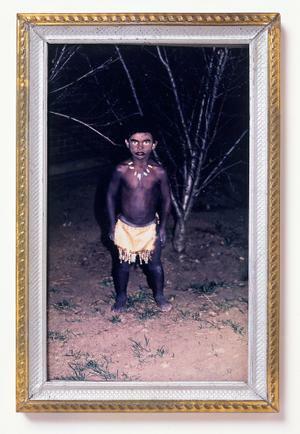 One photo particularly demonstrated this, showing the artist aged six, dressed in loincloth and wearing blackface. The difficult laughter his work prompts has often singled Murray out as a quirk or anomaly in an art community given over to anxious interrogations of self and subjectivity, a view that seems to suggest that South Africans are incapable of self-mockery. Not so. Although somewhat overlooked, South Africa has a rich satirical tradition. Murray is keenly aware of this, having previously expressed his indebtedness to Derek Bauer and Jonathan Shapiro, political cartoonists whose work has mercilessly pilloried all aspects of South African public life. Also Conrad Botes, a comic book artist whose sinister pop vision is receiving increased attention. In the final analysis, though, it has to be said that Murray’s dark comedy is not the singular reason for his enduring appeal. His work is equally compelling for the occasionally wilful detours it makes into abstraction, the artist purposefully working by subtracting, allowing forms their own voice. And, of course, there is Murray’s pop aesthetic. Working with few peers, Murray has fashioned a colloquial version of a globalised pop tradition, one that tentatively calls itself African, but only to expose the comical absurdity of such a claim.